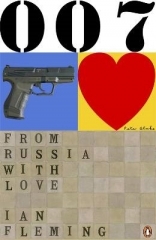 It’s called “From Russia with Love Penguin Decades edition” and it’s being released on 1 April 2010 in the UK. Artwork for it was unveiled at CommanderBond.net not long ago. I personally think it’s a pretty ugly cover and the Walther P99 makes absolutely no sense in the context of Ian Fleming’s James Bond especially since in the very next novel, Dr. No, James Bond hands over his trusty Beretta 418 for the infamous Walther PPK. That said, the original From Russia with Love hardcover as designed by Fleming and illustrated by Richard Chopping included a .38 Smith & Wesson snubnosed revolver which to my recollection wasn’t in the book either. As far as the cover goes, I’d rather buy the recent Centenary edition from 2008 as seen here. Here’s what Penguin has to say about it. Penguin Decades bring you the novels that helped shape modern Britain. When they were published, some were bestsellers, some were considered scandalous, and others were simply misunderstood. All represent their time and helped define their generation, while today each is considered a landmark work of storytelling. Ian Fleming’s From Russia with Love was published in 1957 and made suave, steely secret agent James Bond an icon. Here 007 encounters the deadly machinations of Russian organisation SMERSH, the fiendish Colonel Rosa Klebb – and the irresistible beauty Tatiana Romanova – in one of the most thrilling classic novels of the Cold War. That said, From Russia with Love is my favorite Fleming novel and can’t recommend it enough. From Russia with Love is considered both the best James Bond novel, and the best of the James Bond film series.